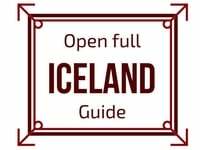 Let's plan your visit to Thingvellir National Park Iceland, a Unesco World Heritage site of geological and historical significance. Located on the Golden Circle, it is one of the most popular places to visit in Iceland. Here is my guide to organize your visit. Don't miss the unique Snorkeling experience! Thingvellir (Þingvellir) is a UNESCO World Heritage site of historical (ref 1152), cultural, and geological importance in southwestern Iceland. It is one of the most popular tourist destinations in Iceland with mountains, rivers, lake, waterfall and fault lines. Geologically, it is a series of huge fissures in the earth’s crust caused by the rifting of the North American and Eurasian Plate. It created beautiful rock features. The largest fault line, Almannagjá, looks like a canyon and is home to the Oxararfoss waterfall. Some of the fissures are full of clear water. Nikulásargjá, a.k.a. Peningagjá (“coin fissure”), is filled with coins at its bottom. And the Silfra fissure is the one where you can dive. 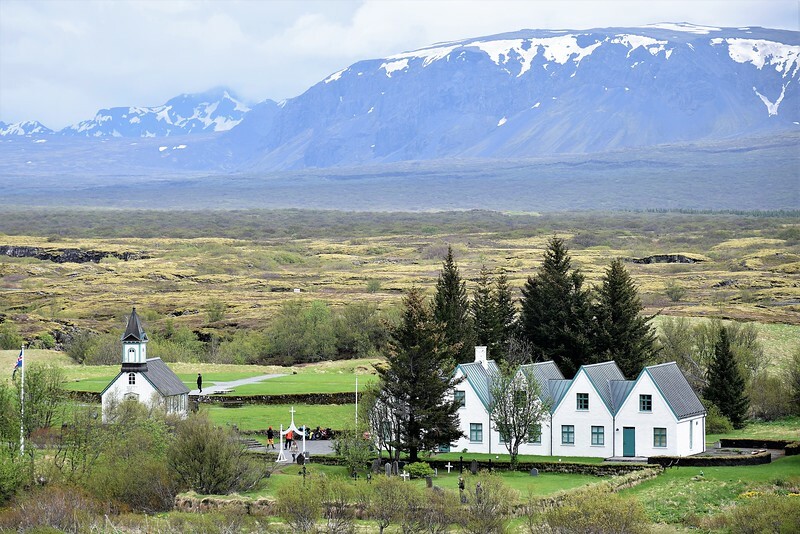 Historically, it is the site where parliament was established in the year 930 (said to be the founding of the nation of Iceland) and remained there until 1798. Thingvellir National Park was established in 1928-1930 to protect the remains of the parliament site and was later expanded to protect natural phenomena in the area. There are lots of places to go off and explore. With the Gullfoss Waterfall and the Haukadalur Geothermal area, it is known as the Golden Circle. 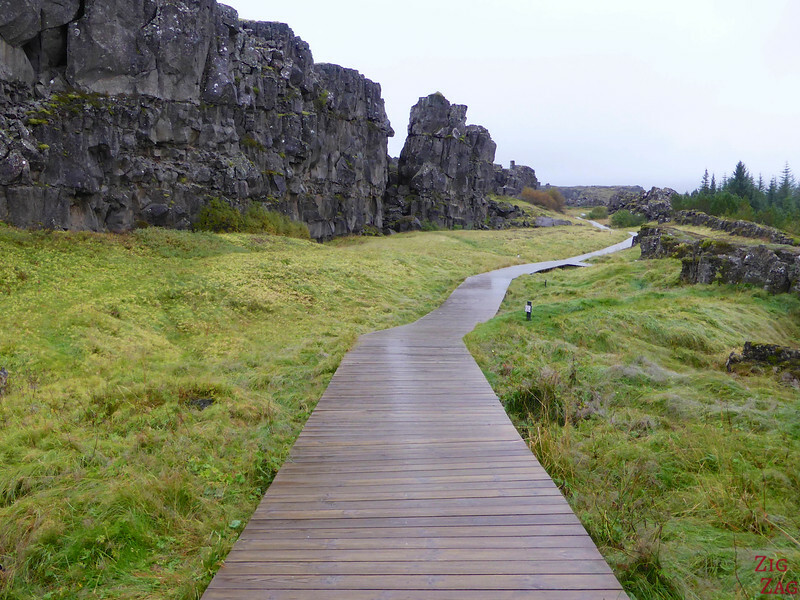 For the shorter path to Öxarárfoss waterfall, turn right on Road 361 1km. The parking area will be on the right. 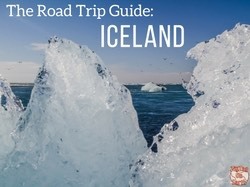 Thingvellir, along with many other beautiful places, is included in my eBook: The Road Trip Guide - Iceland. 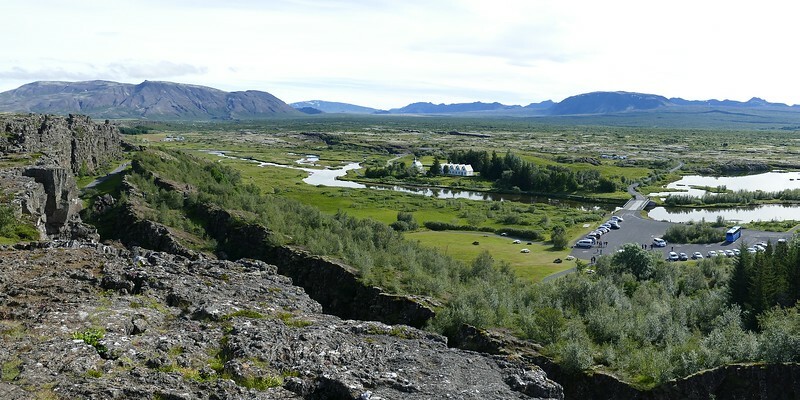 As it is part of the Golden Circle, expect many tourists and buses. As always early or late mean less of them. 2 areas to get food, information and toilets: At the North of the canyon you have to pay to use the toilet. In the lower area there is a cafe and free toilets. It is located near the camping area. There are viewing platforms which give beautiful views and many easy trails among the evidences of rift. Parents need to be aware not to allow their children to wander off, as there are many deep fissures. There are no hotels or B&Bs right in the National Park. But you can find nice options South of the lake and on the Golden circle. 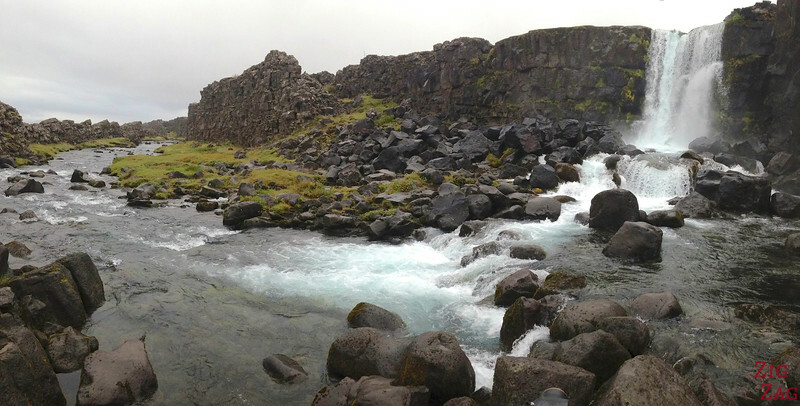 The river Öxará traverses the Thingsvellir national park. One attraction is the small Öxarárfoss waterfall, which can be accessed after a short walk from the parking area on the eastern end of the fault line. Some people say it was artificially created because of a water diversion several centuries ago to provide better access to drinking water for the assemblies. It is a small (20m height) and not so powerfull waterfall by Icelandic standards but I enjoyed its rocks at the base and the surrounding of the canyon. Best light for photography is in the morning. It is one of the 21 waterfalls I photographed in Iceland. The rift valley narrows from about 20-25 km in the NE to about 10 km in the SW. Its walls are moving apart of about 7 mm per year. The floor is sinking at about 1 mm per year. The last major earthquake occurred in 1789. Almannagjá, one of the fault lines, is 7.7 km long and at its largest point 64m wide. There is an easy pathway inside to admire it. And in the photo above you can see it continuing past the waterfall. The church in Thingvellir is opened during the day from May to September. The current church dates back to 1859. Its Icelandic name is Thingvallakirkja. Small, with wooden decor, it is a nice short stop between Walks in the fault lines. 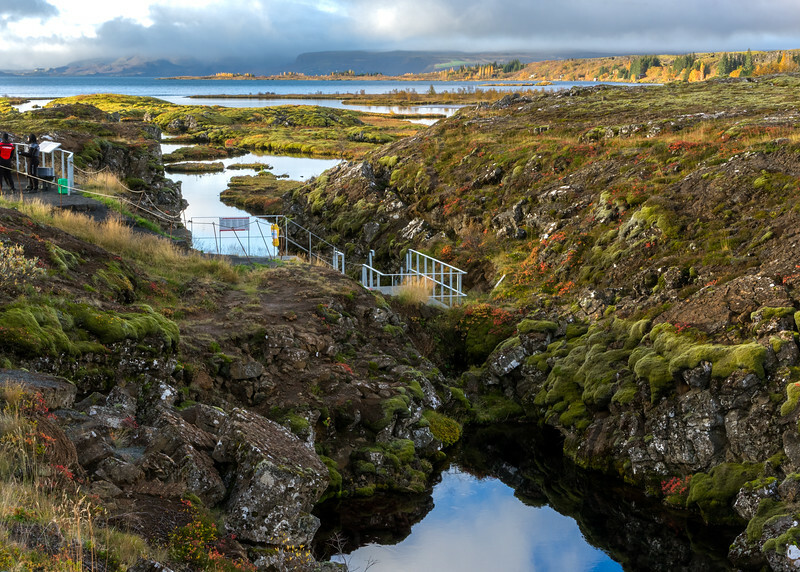 One of the most famous activities in the National park and in all of Iceland, is to dive or snorkel in the Silfra fissure. A unique experience in Crystal clear waters. Sadly I have not done it, but people rave about the experience the transparence of the water and the surreal feeling. 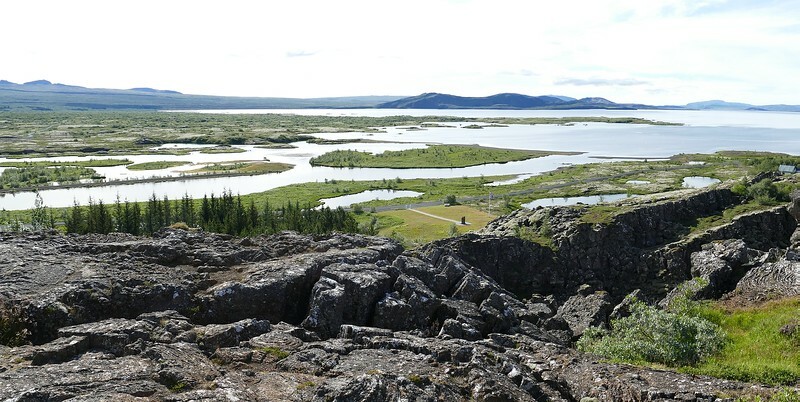 At the South end of the Thingvellir fault lines is a large lake, as you can see in the picture below. Thingvellavatn is the largest natural lake in Iceland with a surface of 84km2. Its deepest point is at 114m. Part of the lake is included in the Nation park. 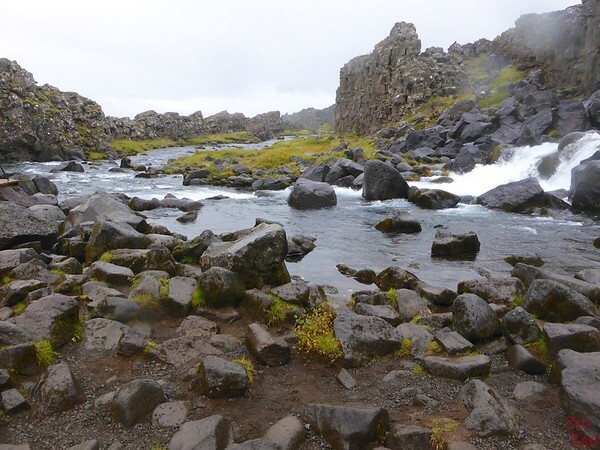 For many more pictures check out Iceland for 91 days post on the Almannagjá gorge or the French speaking blog Canadatry with beautiful shots for Thingvellir. Do you prefer visiting historical sites or natural wonders?